Although fax machines are a dying transmitting medium, we are still here to offer helpful tips for you and your fax. Out of the box the Sharp fax boards are paper conscious and have the fax confirmation page disabled. 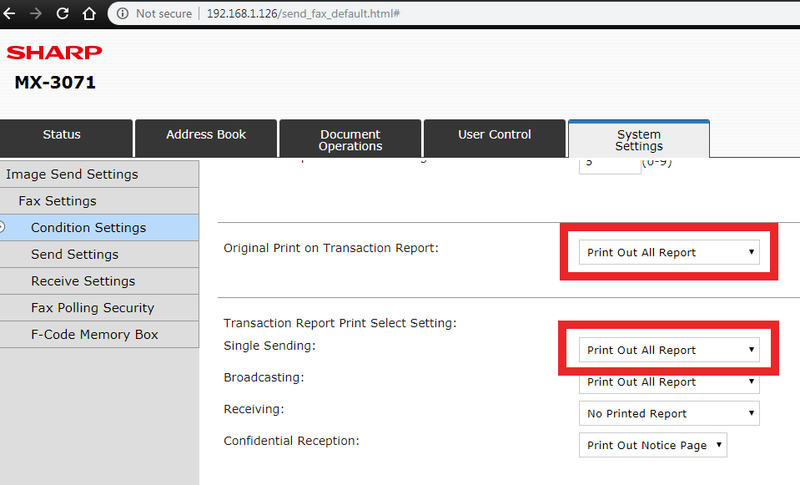 It’s a few quick clicks or button presses to activate the fax confirmation page. Type the IP address of your copier into a web browser, hit enter on your keyboard. If you do not have your IP address click here for instructions on how to print it out. Click Submit at the top or bottom of the page. Skelton Business Equipment is the premier Sharp copier dealer in Houston. We will get you a great machine at a great price, and provide excellent service after the sale. We pride ourselves on the service we provide to the entire Greater Houston Area. Whether you purchase or lease a new or refurbished(used) copier, Skelton Business Equipment will take excellent care of your printer for years to come. Our service call turnaround time is 4 hours or less, and we delivery, install and network your machine to print and scan free of charge. Fill out our 1-minute quote request form and see how much money and headache Skelton can save you! You’d be surprised how many businesses are overspending on their printing needs. Don’t be one of them!